A precise and comprehensive overview of bunker activities and fuel oil consumption has become an essential key factor for efficient ship operation. Hoppe Marine’s Bunker Management system is a soft-ware solution for continuous monitoring and reporting of all bunker intakes, fuel oil transfer procedures, fuel oil consumptions and fuel remaining on-board. It is a smart add-on to a precise Tank Content Measurement system. Hoppe’s hydrostatic pressure senors of the HCG series are specialized for the precise bunker mass (mT) determination and recording. Foaming (cappuccino effects) are eliminated by measuring principle. A total energy balance supervision is provided additionally, which is mainly based on data from Hoppe Marine Tank Content Measurement, MAIHAK Shaft Power and Performance Monitoring as well as mass flow counters. 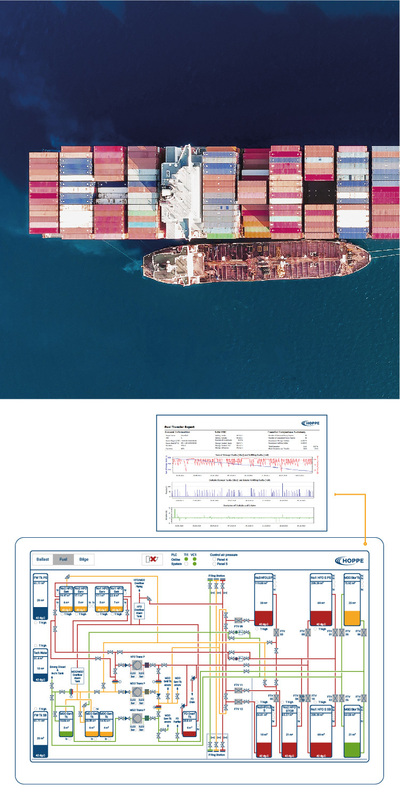 The system enables the ship operator to have a full overview about the movements and the storage of the valuable fuel oil at all time during ship operation. Influencing effects such as for example usage of back flush filter, sludge volume, separator operation or cappuccino effects are monitored by measuring principles and/or statistical analytics. Based on its permanently data logging and analysis features it is a valuable tool in parallel to manual entered fuel data and bunker barge recordings. Thank you for your messsage. Maihak- and Flume-Products and Systems.